Hello Dealsnloot Readers,This is an exclusive one time use offer, valid on your shopping cart, that offers a single .COM domain name at Rs 99. Any additional domain names will need to be purchased at the price mentioned on the BigRock site for a .COM domain name.So Hurry !!! Grab This Loot Offer. 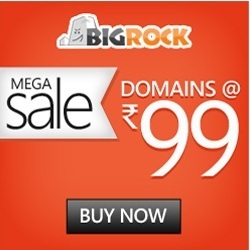 Bigrock offering .com Domain Name for Rs. 99 only.